The DA seems to be having a little bit of a problem expressing himself, as I would guess that what he’s really trying to ask is “Why is this woman bicycling in this intersection while the traffic light governing her direction of travel is red?” So, given the presumptuousness, confirmation bias, and possible psychological projection the original question carries, I considered instead the underlying one. She’s trying to stay safe by getting up to speed before the speeding car traffic behind her reaches the intersection, by which time the light may be green and the speed differential will be dangerous and frightening if she is still stopped. Even if the street has a standard bike lane, the potential to be rear-ended while stopped at a traffic light by a driver who doesn’t see you is real. Solution: Install leading bike signals or allow cyclists to cross with existing leading signals for pedestrians. Physically separated bike lanes combined with leading bike signals make for an even more effective answer to this problem. She suspects that a nearby musical panhandler may be contemplating violence, so she has decided to jump the red light to escape this more immediate danger. After all, she’s not surrounded by a metal cage with lockable doors to protect her as she waits. Solution: As Idaho has been doing forever now, allow cyclists to jump reds after coming to a complete stop if the coast is clear. Solution: Install bike boxes and leading bike signals. Perhaps only moments ago, there were cabs or private commuter buses piled up on the other side of the intersection, blocking the bike lane, as very often happens in that exact spot near the pedestrian crossing leading to the Caltrain station. In this case, she may have decided to jump the light in order to more safely negotiate the up-coming pinch point. Starting from a stop at the same time as the car traffic would have made it much more difficult for her to avoid getting run off the road or intimidated by impatient drivers. Solution: Install bike boxes and leading bike signals and implement physically separated bike lanes in areas likely to see a lot of conflict with stopped cars. If this photo was not of the busy Caltrain intersection, I could have added to the list the possibility that there were no cars traveling in the same direction she was, and after waiting many moons for a green light, she finally realized that the traffic signal was one of the “smart” ones that would never actually detect her bike and turn green. Solution: Following Portland’s example, install bike-specific detectors, clearly label them, and include an indicator light that tells cyclists they’ve been detected. There’s nothing like knowing the infrastructure was lovingly made with you in mind to encourage you to comply with its wishes. While contemplating the photo a second time, I noticed one very revealing detail: The pedestrians on either side of the street are still waiting for their signal and have not started crossing. This means the traffic signal is frozen in that brief moment between the time the east-west traffic light turns red and the north-south pedestrian light turns green. So in this particular case, our cycling hero probably just didn’t have enough time to clear the intersection before the yellow light turned to red, an understandable and common problem cyclists face because the yellow lights are timed for cars, which can and do clear the intersection must faster. This is especially problematic at multiple-lane intersections like this one. So there you go, George. Mystery solved! And here’s my solution: Instead of spending time and money proliferating an inflammatory finger-pointing campaign, invest in trailing bike signals that allow cyclists more time to get through intersections. These would also enhance safety and sanity for everyone by increasing separation between bike and car traffic and reducing the speed differential when the two do meet up again down the road. While the strategies I’ve just outlined are easy ways to bring more order and predictability to our intersections, by far the most effective way to defuse the conflicts and dangerous dynamics happening on our roads is to use well known traffic-calming measures to slow car traffic down, providing all road users with the necessary leeway to safely and mindfully negotiate the space together. I mean, after all, what’s the rush? 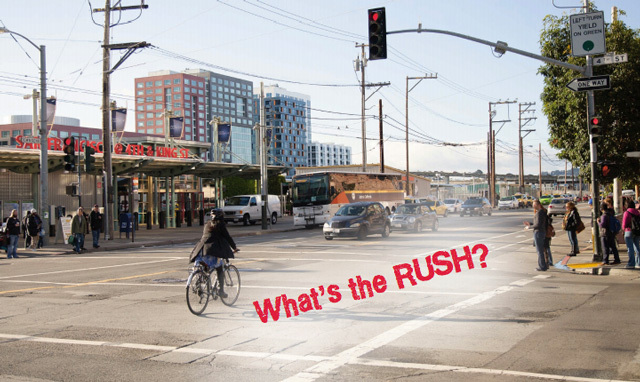 Posted in Bicycles, San Francisco	| Tagged George Gascón	| Comments Off on What’s the Rush?